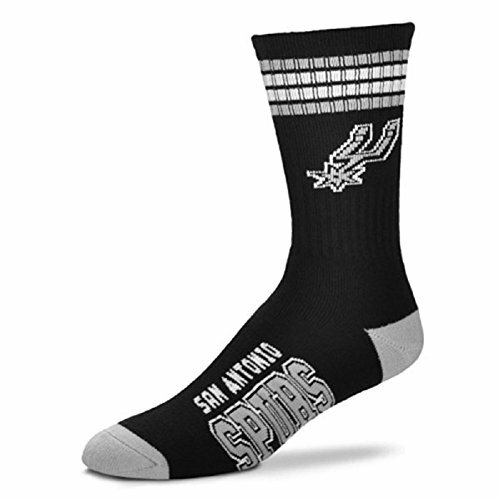 Show everyone you're a true fan on gameday or any day with these officially licensed Men's 4 stripe Logo Socks from For Bare Feet! Featuring bright, vibrant colors and a woven-in design, they prominently display your favorite NFL team in two places - at the ankle and across the side of the foot. And since the design is woven right into the sock, it will stretch and move with you, and never bind or crack.Comfortable, durable socks have an anatomically formed y-heel to ensure the best, most natural fit. These socks aren't just comfortable, they're made from acrylic, which has a built-in moisture management system: the fiber wicks perspiration and moisture out of the sock so it can quickly evaporate, helping keep feet healthy and dry. And they're durable enough to last through wash after wash. 83% acrylic, 14% polyester, 2% rubber, 1% spandex. Size medium fits men's shoe sizes 5-10.